What processor is the Kobo Forma using? Kobo, on their official page, isn't very clear about the processor that runs on the Kobo Forma. You need to visit their media library webpage to find out that the Forma's processor is the same one that runs on the older Aura ONE, i.e. the single-core NXP i.MX6. The Kindle Oasis uses a more capable 1GHZ dual-core i.MX7D processor. The difference between the single-core i.MX6 and dual-core i.MX7 is noticeable - the Oasis is zippier than the Kobo Aura ONE. It is odd that Kobo decided to stick with the same processor considering the Forma is meant to be their now premium e-reader. Maybe the selection of the same processor was a trade-off due to the Forma's E-Ink's Mobius screen technology. Moko specialize in Kindle e-reader and Fire tablet accessories. The Moko case does cover the Oasis completely, unlike the official Amazon case, but does not provide a flat reading surface when open. The case is not perfect and the quality does not compare to Amazon's official covers but, so far, it is the best option. I use the 'Almond Blossoms' Moko case and the painting's print quality is good. Another issue is the cover's weak magnets; when closed the front cover can move. If you do not mind holding the Oasis bare then a sleeve is a good option to cover the device when travelling. The Amazon Basics eight-inch sleeve, not technically a third party accessory, fits the Oasis perfectly and provides adequate padding. The eight-inch sleeve also fits the Oasis with a case on. Fintie is another manufacturer that produces Kindle cases. I haven’t tested the cover and so can’t judge its quality. One issue that put me off is the cover’s padded vinyl feel. A final point: I would avoid any case with straps, even if advertised compatible with the Oasis. The main issue is the design of the Oasis with one end being thicker. At the thinner end, the straps cover the bottom corners of the screen. Without doubt, the latest iteration of Kindle Oasis is the best e-reader from Amazon. Yet, this is expected considering the pricing and premium tag. The question is if the device offers that much extra to justify the price differential in comparison to other e-readers. Overall, while Amazon should have done more to distinguish the Oasis, the device sets the benchmark for a feature rich and immersive e-reading experience. I am not a fan of the device’s design. The metallic back, without a case, is cold to the hand and the device’s lopsided design makes it uneven to hold. Amazon designed their official case to attach magnetically to the thicker end to provide a flat reading surface. Unfortunately, this leaves part of the metallic back exposed when the case is closed (Amazon withdrew the official case due to design flaws). The buttons are a real plus. They are located at the thicker end and make page turning so much easier with one-handed reading. The buttons can be used left and right-handed, as the Oasis supports automatic rotation. The extra inch makes a significant difference. The device is seven inch across and this means a thirty percent increase in reading screen estate. There is also extra width; the device’s width is closer to the Aura One than the Paperwhite. I find the extra space helps with text immersion and the extra width makes PDF text more legible in landscape mode. If you are coming from the Kindle Paperwhite then you will notice little difference in screen quality (both devices come with an E-Ink Carta screen and 300 DPI). I found the Oasis’s contrast slightly lacking but the text sharp. The adaptive front-light has twelve LEDs that produce uniform lighting with little shadowing. 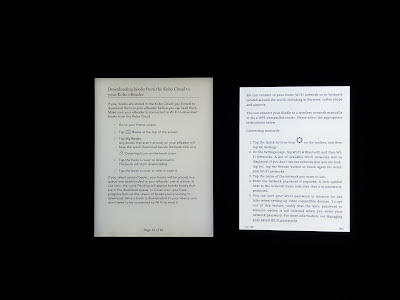 The front-light is the best I’ve seen on an e-reader and significantly better than the Kobo Aura One. 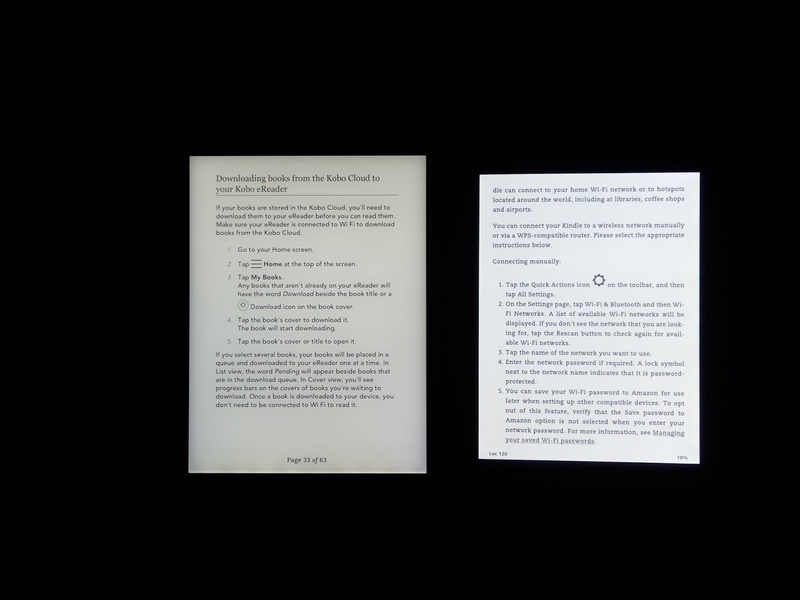 The Kindle Oasis, unlike the Aura One, does not support front-light colour shifting for night-time reading. As stated in a review of the Kindle Basic, Amazon’s Kindle software is feature rich and stable (I have provided an overview of the Kindle’s operating system in the Kindle Basic review. Also, I have previously posted on the Kindle’s good PDF support here). Amazon runs the near same software on all its e-readers. Software differences that do exist cater for device specific hardware features e.g. Bluetooth support and adaptive display lighting. One software issue that continues to frustrate is the limited control over text display. Font size options are set in absolute size and the difference between, for example, size two and three is too disproportionate (the issue is accentuated with a relatively high 300 DPI screen). A possible solution, to get something between size three and four, is to increase font-weight to two. Unfortunately, this option only works with AZW3 e-books. Hopefully, in the future, there will be a software update that extends font weight options to MOBI e-books. The Oasis comes with in-built Bluetooth support and Audible integration. I would recommend going for the 32GB Oasis if Audio books are something important (audio books take a lot of storage). Personally, I find something like a smart-phone, laptop or tablet better suited for audio books. This is Amazon’s first e-reader with waterproofing. I haven’t tested the feature but Amazon advertise the device with an IPX8 rating that can withstand immersion in up to 2 metres of fresh water for one hour. I expected better battery-life, considering the pricing. Based on personal estimation, I found the Oasis’s battery life to be behind the Paperwhite but still last longer than the Aura One. This is not surprising as the Paperwhite has a larger battery capacity (the Paperwhite has a 1320 mAh battery capacity. In comparion, the Kindle Oasis 2 has a 1000 mAh battery capacity). Of course, battery life depends on, for example, front-light intensity, indexing and WiFi. Too expensive for an e-reader? Is the Oasis too expensive for an e-reader? Many technology websites answer in the affirmative. I think the device is dedicated to the e-reading community and for this segment of users, the Oasis might be worth-it. The better question to ask, directed at dedicated e-readers, is if the Oasis is worth-it considering the existence of, for example, the cheaper Kobo H20 and Aura One? In my view, if it is merely a question of hardware then the Aura One would be the better choice. Even so, Amazon’s superior and polished software experience makes the Oasis the better overall e-reader. Initially, when the Oasis was released, I judged the Oasis to be priced too high for what it offers. After using the device, I have change my mind. Yes, the bigger screen finally distinguishes the Oasis compared to the Paperwhite and Voyage. However, more than just hardware, the software is what makes the Oasis standout. Most things just work better, compared to other e-readers e.g. smoother highlighting, syncing of personal documents across Amazon devices/apps, consideration of PDF support and the ability to export annotations in different formats etc. The downside with the Oasis is that it is not innovative enough. I expect more from a high-end Kindle e-reader. For example, stylus support, a larger screen, better contrast and improved battery life. I think the broader issue is not just cost but also Amazon’s conservative strategy in the development of its e-readers. To conclude, before the Oasis, the Aura One was the benchmark for a larger e-reader. Yet, if you are willing to go one inch smaller, the Oasis is the one to go for.